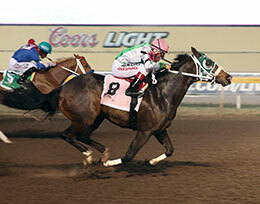 First-crop sire champion Hes Relentless got his first stakes winner and graded winner on Saturday at Remington Park. NORMAN, OK—MARCH 23, 2019—Champion and first-crop sire Hes Relentless got his first career stakes winner and graded winner Saturday when fastest qualifier Ec Revenge won the Grade 2 $396,650 Oklahoma Futurity at Remington Park. Racing for owner Elizabeth Logan Ec Revenge drew off impressively to defeat Pepper Ryan by one-length. A $25,000 Heritage Place Yearling Sale graduate, under jockey James Flores, stopped the clock in :15.307 seconds, a 93 speed index for the 300 yards. Bred by William E. Smith, from the Corona Cartel mare SS Pamilla, Ec Revenge has compiled a 2-for-2 record and banked $164,490. The win by Ec Revenge will push Hes Relentless back to the top of the first-crop leading sire of money earners list next week. With three qualifiers to the Oklahoma Futurity, the son of leading sire One Famous Eagle's offspring banked $206,422 on Saturday night. EC Revenge (8) and jockey James Flores power past Pepper Ryan (5) to win the Grade 2, $396,650 Oklahoma Futurity on Saturday at Remington Park. From nine starters, Hes Relentless has gross earnings of $240,422 with average earnings per starters of $26,713. Named the AQHA Racing Champion 3-year-old colt of 2014, Hes Relentless won or placed in 13 of 15 career starts while earning $616,380. He won the Hobbs America Derby(G3), was second in the Heritage Place Futurity(G1), The Championship at Sunland Park(G1), third in the Rainbow Derby(G1), Zia Park Championship(G1) and was a finalist in the All American Futurity(G1) and Texas Classic Futurity(G1). Hes Relentless dam, The Dreams Flying by Strawfly Special, is the dam of 8 ROM, three black type including grade 3-placed Dreamnwideopen ($84,008) and stakes-placed Flying To The Dash ($59,558). 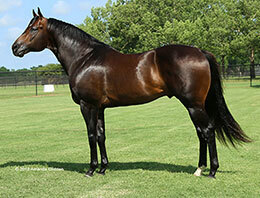 The second dam is the two-time champion Dash For Cash mare Dashing Phoebe ($609,553), dam of 16 ROM, 2 champions, 6 black type including four-time champion Heartswideopen ($1,885,283), champion Special Phoebe ($139,963), grade 3 winner Furyofthewind ($70,554), RG3 winner Dashingfordestiny ($56,961), RG3 winner Solid Demand and RG3-placed Especially Phoebe. This is the immediate family of 2018 AQHA Racing World Champion Bodacious Eagle ($989,286), two-time AQHA Racing Champion American Runaway ($686,355), RG2 winner Dueling Juan ($475,001), grade 3 winner Tempting Destiny ($302,699), grade 2 winner FM Im A Zatanaz Too ($400,530 at 2 2018), stakes winner Corona Ease ($209,820), etc. Owned by a partnership, Hes Relentless stands for a 2019 fee of $3,500 at Bob Moore Farms near Norman, Oklahoma. For additional information or breeding contracts call General Manager Phillip Stewart at (405) 329-8571.